Red Dead Redemption 2, the highly-anticipated sequel to Rockstar Games’ critically acclaimed Western-themed open world video game Red Dead Redemption, is all set to release on October 26, 2018 for the PS4 and Xbox One. 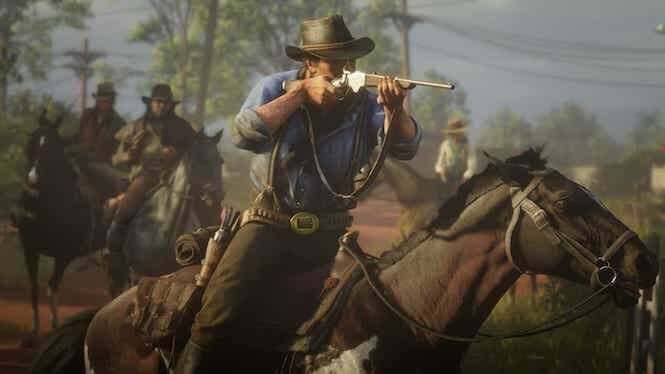 The game, which has been already delayed twice due to the need of ‘polishing’ it further (as stated by Rockstar) is expected to satiate fans’ expectations with a bigger and better playing experience and is likely to be one of the highest selling games of 2018. Here are all the updates you need to know! The premise of the game makes it a prequel to Red Dead Redemption and features familiar faces like Jon Marston, a member of the Van der Linde gang and the protagonist of the first game. Red Dead Redemption 2 is set in America in 1899. The era of the Wild West is coming to an end, and outlaws are being hunted as the country transitions to a new world. You play as Arthur Morgan, another member of the Van Der Linde gang, and must survive and flee across America as the sinister portents of gang infractions threaten to tear your world apart. Considering that Arthur Morgan was not mentioned in Red Dead Redemption, do we see a bleak ending for the protagonist in the upcoming game? Let’s wait and watch! Since you are on the run from the law, you need to make sure your survival game is on point. In Red Dead Redemption 2, you will need to keep hunting in order to ensure you and your camp are fed and sustained. However, beware – food will be scarce and the degradation system of the game will allow the dead to rot and attract carrion. The Honor System from the first game will make a return. You can either be morally upright and a man of integrity or descend into lawless rebellion- the choice will be yours and it will govern the way how merchants and other characters treat you. Remember, you will still be a renegade, so will your morality be a positive factor or negatively impact your story? Intriguing! Another exciting update (according to some leaks) is that Rockstar will be adding a Battle Royale mode, along with Revive, Survive, and Money Grab. Are we looking at a frenzy of bullet rain action? Let’s see! During its latest financial conference call, Take-Two Interactive (the parent company of Rockstar Games and 2K games) President Karl Slatoff stated that Red Dead Redemption 2 will have an “all-new online experience” while CEO Strauss Zelnick expressed hope that the game would “shatter expectations”. Will there be a PC Version of the Game? Though Red Dead Redemption 2 is being pegged as a PS4 and Xbox One exclusive, it could be possible that Rockstar also releases a PC version around a year or later. The fact that one of the game’s developers listed a PC version of the same on their LinkedIn profile further lends credence to its possibility. Rockstar has previously experienced success with the PC release of GTA V, and with rumors swirling around for the next-gen PlayStation 5 console and the next Xbox, it wouldn’t be surprising if a PC version is announced as well. Rockstar has announced three premium editions of Red Dead Redemption 2, which will include a lot of goodies and collectibles to delight fans, as well as include additional bonuses for digital pre-orders. The pre-orders can be done here. Additional weapons for the game’s Online Mode. The open world of Red Dead Redemption 2 will be sprawling and expansive, and there is a strong chance that you could miss out on some exciting elements. Fret not, for Rockstar’s official guide is available for pre-order. The guide comes in the Standard Edition and Collector’s Edition and will act as your companion through your quests, side missions, and collectibles.